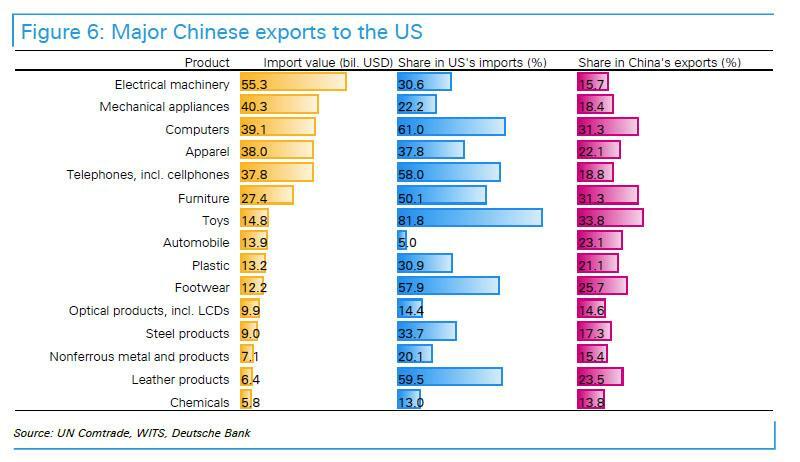 Assuring that a second retaliation by China in the escalating trade war is just a matter of days if not hours, moments ago the US Trade Representative released a list of Chinese product subject to 25% tariffs as part of Trump's Section 301 crackdown on Beijing Intellectual Property abuses, focusing on China's high tech product push. 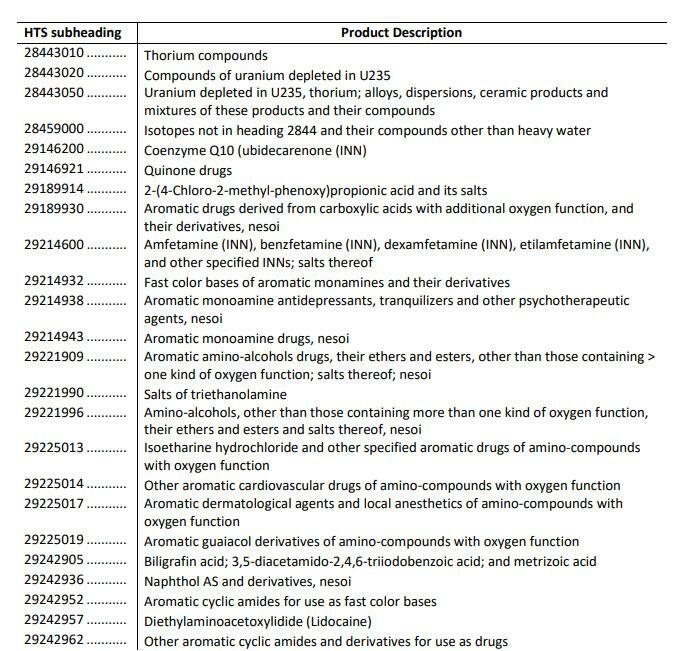 The list covers about 1,300 tariff lines, or 44 pages, the USTR said referring to a system of codes used to categorize products. It added that the value of the list is approximately $50 billion in terms of estimated annual trade value for calendar year 2018, a level which is "appropriate both in light of the estimated harm to the U.S. economy, and to obtain elimination of China’s harmful acts, policies, and practices." What else is in the list? In some cases the tariffs targeted raw materials and components used to assemble finished goods in the U.S., such as ingredients for insulin, while in others the items were complete products, like Chinese-assembled cars. Many of the affected products were machines used to make other things, vexing factory owners accustomed to being praised by Trump for manufacturing in the U.S. While apparel and footwear won’t get additional tariffs, some equipment used to make them, like textile printers and injection molders for shoes, are getting taxed. “Tariffs on certain machinery will make American-made products more expensive,” said Matthew Shay, president of the National Retail Federation, in a statement. With the list published, the National Association of Manufacturers will be consulting with its members about what specific products on the list it may oppose and try to get removed during the comment period, spokesman Michael Short said. The group urged Trump to pursue a bilateral trade agreement with China rather than act on its own. Trade industry associations also said they are expressing their concerns about the tariffs publicly and privately with the administration and will be active during during the comment and review period to determine the final list of products subject to tariffs. The list of products included in the USTR list also lines up with technologies China identified in its “Made in China 2025” strategy, White House trade adviser Peter Navarro told Bloomberg Television on March 28. As a reminder, "Made in China 2025" was announced in 2015, and highlighted 10 sectors that need support on the way to China becoming an advanced manufacturing power; these include: Information technology, high-end machinery and robotics, aerospace, marine equipment and ships, advanced rail transport, new-energy vehicles, electric power, agricultural machinery, new materials, and bio-medical. China also has a separate development strategy for artificial intelligence, published in 2017. While both investors and businesses have been awaiting details of Trump’s plan to place tariffs on $50 billion in Chinese goods, nobody was looking forward to the list more than China itself. As we reported this morning, China's US Ambassador said that Beijing is preparing aggressive counter-measures of the “same proportion, scale and intensity" once the Trump administration imposes further tariffs on Chinese goods. USTR Robert Lighthizer had until April 6 to publish a list of proposed products. There’s now a 60-day period when the public can provide feedback and the government holds hearings on the tariffs. Back on March 22, Trump said that the tariffs were aimed at penalizing Beijing for what the U.S. alleges to be theft of American companies’ intellectual property. While China already imposed tariffs in response to Trump’s actions on metal imports (under Section 232), it has repeatedly threatened additional retaliation if Trump unveils the list of Section 301 tariffs, something the Administration did on Tuesday afternoon. U.S. retailers have voiced concerns tariffs (and an escalating trade war) may eat into consumer products such as shoes and clothing, hitting companies including Walmart Inc. and Target Corp.
On Monday, various PMI indices suggested that fears of tariffs are leading to a drop in confidence about the economy, and early inflationary pressures as producers begin to stockpile core products. The full list of products that fall under the purview of Section 301 tariffs is below (link).